George Nakashima (1905-1990) is one of the most recognized furniture designers of the 20th century, celebrated for his traditionally-inspired designs and legendary craftsmanship. 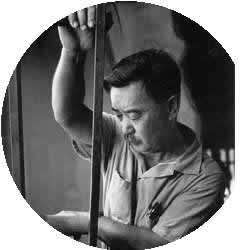 While in an internment camp during World War II, he learned the art of Japanese woodworking from a local elder. His furniture is recognized for its simplicity and for the careful attention to material qualities. Nakashima’s Splay Leg Table and Straight Chair designs were created for, and originally produced by, Knoll in the 1940s. These pieces combine the modern aesthetic with a deep respect for the natural forms of a tree and the inherent beauty of wood.